South Africa is a beautiful country, with diverse cultures and spectacular scenery – yet its tourism potential remains unfulfilled. And thanks to a myriad of social and economic problems – which has sent the rand to record lows against the world’s major currencies, and left the country on the brink of recession – the country has inadvertently unlocked a potential gold mine: tourism. Tourism is one of the few industries that can take advantage of the country’s economic ills. According to Stats SA, tourism direct GDP was R103.6 billion in 2013. The industry’s contribution to total GDP is 2.9% – woeful. By comparison, Malaysia is at 7.2%, Thailand at 9%, while Mauritius is at 11.3% and Seychelles is at 21.2%. According to 2014 data from the World Travel & Tourism Council (WTTC), South Africa ranks 106th in the world for tourism to GDP, below neighbours Botswana and Namibia. International visitors contributed 43% (R94.2 billion) to South Africa’s total in 2013. During that year, 14.3 million non-resident visitors visited South Africa, increasing from 13.1 million in 2012 and 12.1 million in 2011, Stats SA said. The Home Affairs Department said in January that more than two million foreign visitors crossed the country’s borders between December 1, 2015 and January 7, 2016. For every R100 spent by an international visitor in 2013: R27 was spent on non-specific products; R15 on tourism-connected products; R14 on accommodation; R12 on road transport; R12 on air transport; and R20 was spent on other products. The number of persons employed in the tourism industry in 2013 was 655,609 – representing 4.4% of all employed people in the country. South Africa’s appeal to the world is unquestionable. It really does have everything one would want in an exotic holiday – bar snow (and even that is available if you head to the right places during winter). Its only downfall is its geography – which can dissuade people who are not keen on long flights, and the associated cost. The latter can now be wiped off the cons list. South Africa’s economy is crying out for economic diversification – its too resource reliant. It is time to use the resources we have above ground, and not that which is underneath. Some will argue that its not just South Africa that is in an economic bind, that it’s a global issue. People will always go on holiday, especially if they can sniff out a bargain. The Barmy Army recently traveled to South Africa to follow their national cricket team. So impressed were they with the exchange rate, they sang a song about it. 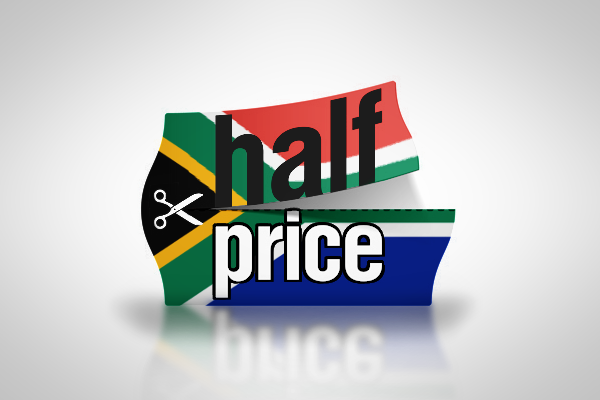 South Africa is open for business – and has a half price sale tag on it. So where are the vuvuzelas to trumpet that to the world?